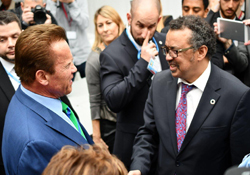 WHO Director-General Dr Tedros Adhanom Ghebreyesus meets actor and former Governor of California Mr Arnold Schwarzenegger during the High-Level Presidency Event on health. The 23rd Conference of the Parties (COP23) to the United Nations Framework Convention on Climate Change (UNFCCC) took place in Bonn, Germany, on 6–17 November 2017. The Paris Agreement, adopted on 12 December 2015, marked the beginning of a new era in the global response to climate change. The “right to health” acknowledged in the Paris Agreement is central to many of the actions that countries will take on climate change in the years to come. WHO/Europe plays a leading role in providing evidence and shaping policies on existing and emerging environmental health risks through the European Centre for Environment and Health (ECEH), located in Bonn. The role of WHO during COP23 was to promote health as an argument for ambitious action on climate change, to strengthen capabilities among parties to the UNFCCC related to climate change adaptation for health, and to advocate for healthy mitigation – efforts to cut or prevent the emission of greenhouse gases that are also opportunities for improving health. Over the 2 weeks of COP23, the ECEH functioned as the centre of operations for the 25-member WHO delegation. It also co-organized the Global Climate and Health Summit and a side event on climate adaptation for health. WHO/Europe, together with WHO, the Global Climate and Health Alliance and the Health and Environment Alliance, co-hosted the Global Climate and Health Summit, which ran in parallel to COP23 on 11 November 2017. In her welcome address, Dr Joy St John, the newly appointed WHO Assistant Director-General for Climate and Other Determinants of Health, emphasized that tackling the challenges of climate change “is fundamental to the future good health and well-being of all peoples, and thus also at the very core of our striving for sustainable development”. The Summit combined plenary presentations with high-level political representation to engage, influence and encourage commitment to action. Dr Piroska Östlin, Director of the Division of Policy and Governance for Health and Well-being at WHO/Europe, underscored the importance of networks for strengthening action and the need for robust adaptation. She noted, however, that “the long-term sustainable resilience of our communities can only be achieved through healthy mitigation of climate change”. The take-home message from the Summit was to learn, engage and connect within the health community to advance intersectoral action on climate change to protect global health. The High-Level Presidency Event “Health actions for the implementation of the Paris Agreement” took place on 12 November 2017. It was the first of 5 such high-level events on different themes that took place during COP23. WHO organized the session in close collaboration with the Fijian COP Presidency and the UNFCCC. It was hosted by Hon. Frank Bainimarama, COP23 President and Prime Minister of Fiji. At the High-Level Presidency Event, WHO, in collaboration with the UNFCCC and in partnership with the Fijian COP23 Presidency, launched a special initiative to address the health impacts of climate change in Small Island Developing States. “Leaving no one behind means that we are all accountable for those whose voices are not heard the loudest, and whose interests are the most easily ignored,” said Dr Tedros Adhanom Ghebreyesus, WHO Director-General. Following a bilateral meeting with Mr Schwarzenegger, Dr Tedros joined Ms Patricia Espinosa, Executive Secretary of the UN Climate Change Secretariat, to sign a memorandum of understanding to renew the 2 institutions’ joint commitment to tackle public health challenges emerging from rising temperatures, and to help countries boost the efficiency of their response to climate change. Throughout COP23, WHO and partners were involved in many health-related side events to position health as a powerful argument for more ambitious action on climate change.